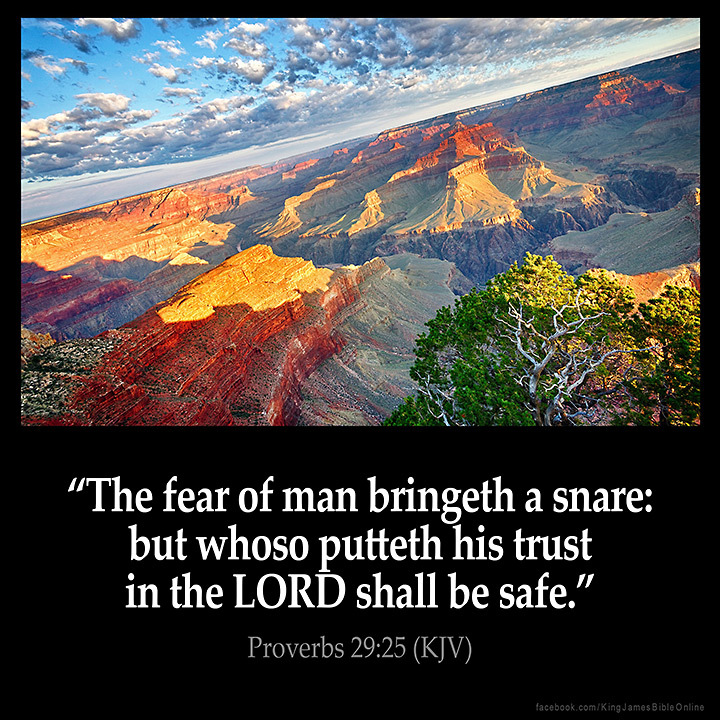 The fear of man brings a snare . . .
"Which Will You Choose - the Fear of Man or the Love of Jesus?" This month I have been contemplating this season of extreme confrontation that's in the world around us today. There's contention over what we say, how we say it, what we do and how we do it. This contention has made the Church even more vulnerable to falling prey to the "spirit of the fear of man." "Meanwhile, Peter was still standing in the courtyard by the fire. And one of the guards standing there said to him, 'Aren't you one of His disciples? I know you are!' Peter swore and said, 'I am not His disciple!' But one of the servants of the high priest, a relative to the man whose ear Peter had cut off, looked at him and said, 'Wait! Didn't I see you out there in the garden with Jesus!' Then Peter denied it the third time and said, 'No? '—and at that very same moment, a rooster crowed nearby." At this point in the reading of the Scripture a rooster crowed right there in Jerusalem at "Gallicantu," stunning all of us! I felt like Holy Spirit hit me in my gut as I began to feel such an upheaval of emotion (I'm not normally unstable in my emotions) and I began to sob. It was as though I was grieving with Peter over what he had done, and I couldn't stop crying. I had to withdraw myself from the crowd and our children who were traveling with us came over to me and tried to calm me down, but I couldn't be consoled. It was at that moment that I had a vision of Jesus beaten and chained in the dungeon located directly below the very place that we were standing. And I was experiencing a pain like what Peter must have felt in his denial. I heard Holy Spirit say, "Peter chose to embrace the 'fear of man' over 'love for Jesus.' What will you choose?" Recently, I had a series of 3 dreams that dealt with this subject. In the dreams I was able to overcome the fear of man and I was rewarded for not moving in intimidation. By faith I was able to carry out the Lord's strategy. I was at my job and I was placed on a team. We were working on a very hard project. No one knew what to do, but the Lord gave me specific instructions on how to carry it out successfully. I knew that the group would disagree with the plans and would not allow me to proceed if I told them what they were. But I knew what I must do. Secretly I went ahead on my own and completed the project. Once I had completed the project I turned it in. I gave the credit to the team as the Lord had instructed me and it was a success and everyone was happy. Because I had obeyed the Lord on the first project I began to hear the Lord more clearly, and now as a result I was able to move with more confidence and spontaneity. How shrewd are snakes? They're very shrewd! A few other synonyms for shrewd could be wise, wary or prudent. They know how to hide and escape for protection. Other animals are going extinct, while they continue to flourish, and they seem to be able to live in all kinds of places and conditions. We must be wise, shrewd and prudent as a snake and harmless as a dove! Why does the Lord use the phrase harmless as doves? Because the dove is often compared to purity and innocence. Maybe you've been like a Peter and haven't always been wise or shrewd and you've blown it. We can thank God that this wasn't the end of Peter's story. For God is not only the God of the second chance, but He's the God of another chance. And so, Peter went on to be one of Christ's greatest disciples! You know the story. Jesus came to him at the very place where He had called him and restored his heart there. And Peter won 3,000 souls at Pentecost after his restoration. There's hope for us all! One of the amazing facets of God's character is His incredible patience with us. Psalm 86:15 say it well: "But Lord, Your nurturing love is tender and gentle. You are slow to get angry yet so swift to show Your faithful love. You are full of abounding grace and truth." The Lord has placed wisdom and discernment in you so that you know what to do and how to perform it. He's breaking the "spirit of the fear of man" off of you today and replacing it with His courage. For you have been trained up to know the voice of the One you love and the voice of the One who loves you. He has come to set that love as a fire in your bones. For Jesus said in Luke 12:49, "I have come to set the earth on fire. And how I long for every heart to be already ablaze with this fiery passion for God!" So be ablaze with His passion! And you will step into a new confidence this day. I declare that you will not be fooled by the voice of the intimidator, but you will rise up with more freedom and spontaneity than ever before. You will rise up "wise as a serpent and harmless as a dove"!